It’s been over 40 years since these magnificent climbs last appeared in the Tour de France. For long-time Tour de France fans, the route for stage 16 may not be that familiar – as it’s been over 40 years since these climbs last appeared in the TdF. So just for fun, here’s a very brief glance at stage 16 of the 2009 Tour de France. With a bit of info on the start and end towns and a tiny slice of history. 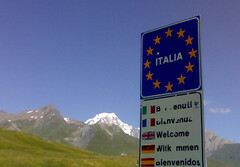 Bring your passports as this stage starts in Switzerland, then visits Italy, before finishing in France. The route for this short 160 km stage is quite simple. The riders are either going up or going down – two climbs, two descents. First and immediately the course climbs Col du Grand St Bernard – at 2,469 metres (8,100 feet) – a real monster – and the highest pass in the 2009 Tour. 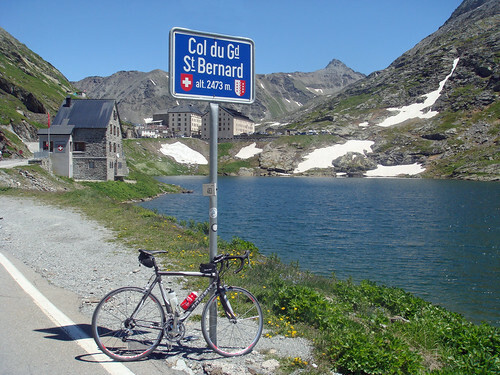 The second climb – Col du Petit St Bernard at 2,188 metres (7,180 feet) – is long but never steep. This strategically located French speaking Swiss town has extensive Roman remains including a well preserved amphitheatre that still hosts Cow Fights. For cyclists, 20 miles to the north is the UCI World Cycling Centre, in Aigle. And to the east, the Valais region with it’s Fendant wine, fruit orchards, and big mountains (including the Matterhorn) is pretty much paradise. First, a little history: This pass has been used for almost 3,000 years to cross the Alps. Julius Caesar crossed with an army in 57 BC. 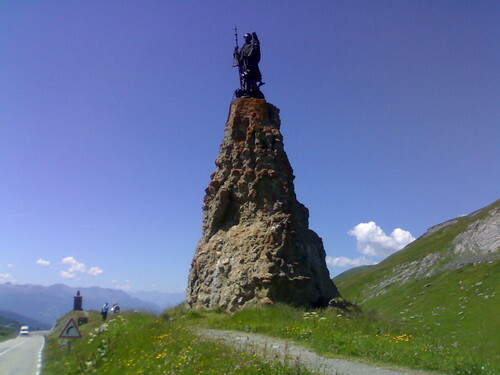 In fact, one of Caesar’s generals fought a significant battle versus the local Celtic tribe at Martigny. Today, along the route are signs with drawings commemorating Napolean’s crossing with 46,000 soldiers in 1800. In the 900’s Saint Bernard of Menthon opened a Hospice to provide a safe haven for travelers – the hospice is still operating today. The climb: This is a huge climb. Although the official site lists the climb as 24.4 kms, don’t believe it. 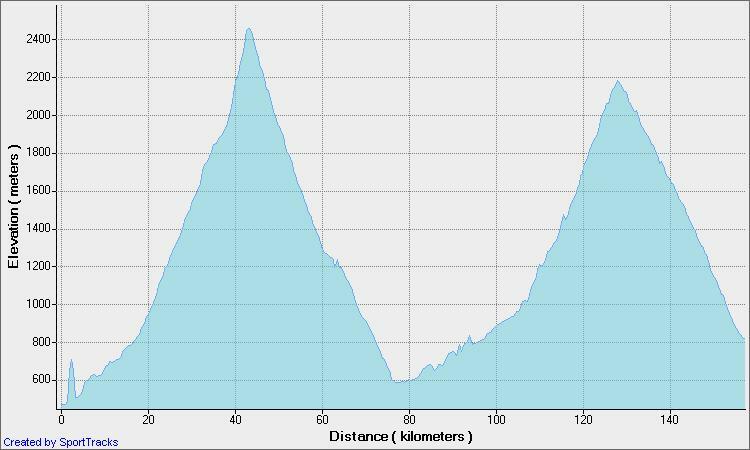 It is uphill from the very start – and although not that steep to begin, it is over 40 kms long and almost 2000 metres of ascent. The first 30 kms or so climbs gently through a scenic valley. It’s actually not the best route for cyclotourists as the traffic is light but fast and there is a very long covered stretch (that’s pretty awful. 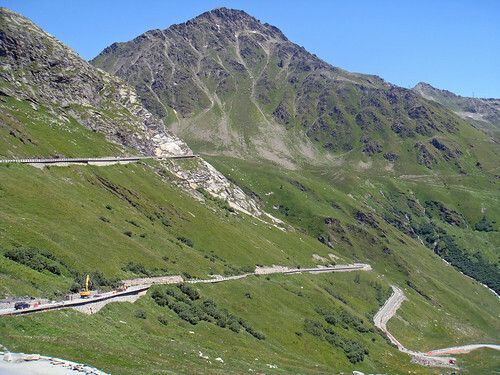 About 7 kms before the summit, the main road enters a several mile long tunnel until Italy. But the Tour will turn-off here and take the ancient road over the mountain. Here it gets fun. It is beautiful, steep, and lots of hairpins. Four of the last five kms average 9.5 %. It’s the steepest stretch of the day. The descent is over 30kms down to Aoste. When I rode this side in the summer, the surface was truly awful, with construction was everywhere. It seems they were getting ready for the Tour. I believe it has appeared 3 times in the Tdf (1949, 1953, 1963). The climb is listed as 22.6 kms, averaging 5.1%. But again, before the climb starts the route will be ever so gently uphill from Aoste. For example the 4 kms before the “start” is about 2% average – starting at Morgex. The top is the French/Italian border and another giant Saint Bernard du Menthon statue. 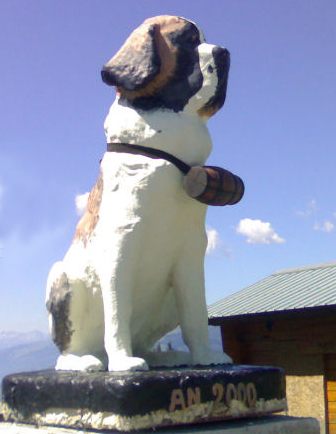 Unlike the Grand St Bernard, there are no customs controls – as both EU countries. From here it’s about 31 kilometres completely downhill to the finish. the descent is not steep or particularly technical – it will be a hair-raising finish. Prediction? There are two more mountain stages after today. So it doesn’t need to be a big day for the leaders. A rider that can climb obviously but more importantly someone that descends like a madman. 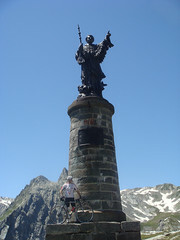 The FinishTown: Bourg-Saint-Maurice, France This is a great base town for cyclotourists. At the start of loads of climbs including five giants – Cormet de Roselend, Les Arcs, La Plagne, Petit St Bernard and Col de l’Iseran – the highest and longest pass in France (the top of Bonette is not a pass). It is also the last stop of the high speed train into the Alps. So access is far but relatively easy from Paris. This is going to be tasty and your description is making it only better. Ever thought of covering the Tour for a newspaper? You would be good at it. Nice review… It looks punishing. I think I’m winded from just reading. Have you ridden this entire route all at once? It would be worth going here just to see the cow fights–imagine 40 minutes of cows shoving each other! Is there betting? Alphorns? 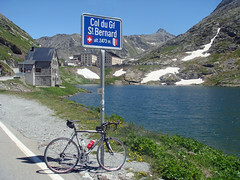 I have ridden a short distance of the Grand St-Bernard in Switzerland but would love to do the whole thing. Looks a lovely place to cycle. 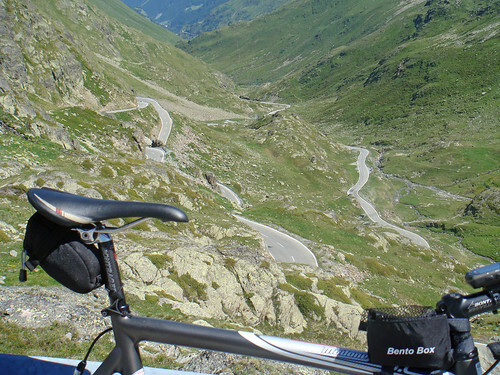 Grand Bornand has done well in previous years as a checkpoint or stage for the infamous event. It’s surprising that the event in 2009 is entering regions of Italy plus Spain as well. It also appeared in 1959.